One of the hottest books in comics, God Country, isn't letting up as all hell breaks loose when Emmett goes looking for Dee after she's kidnapped by Balegrim. Meanwhile, Roy and Jane are surrounded by an oncoming onslaught of the undead. As straight-forward yet spectacular as this issue is, I'd rather not give anything away. Emmett enters Hell to retrieve Dee as Balegrim uses her as a bargaining chip to get Valofax back for his father. You can imagine Emmett is having none of it. What I do want to highlight is Donny Cates' writing and most of all his protagonist, Emmett. Cates has created one of comics' best characters. In issue four, Emmett is a man on fire, determined to get Dee back. There is no hesitation, he's decisive and unafraid. It's this proactive approach to Emmett that makes him a force of nature, a man emboldened by a magical sword that keeps his memories intact and his Alzheimer's at bay. This is a huge contrast to Emmett without the sword. He's a mere mortal suffering from a heartbreaking condition that renders him erratic and his family unfamiliar to him. But it's his ability to recall his beloved wife who passed long ago that drives him too and endears him to readers. Emmett is a passionate man, determined to hold on to these memories for as long as possible. Not even the devil himself can take the sword from his grip. And so, Emmett faces whatever monsters in his path to keep his family whole both literally and figuratively. He's taking the fight to Balegrim and that's what we want our heroes to do. We want them to fight evil, look at it in the eye, and conquer it with all their might. It's what you'd expect a parent to do - fight for their family. Emmett is our grandfather saving the day in the most glorified way possible. Geoff Shaw continues to provide some of the best cinematic panels there is in comics. The story calls for it and he doesn't disappoint especially once Emmett enters Hell. Shaw also does emotive and expressive detail as well, versatile enough to create large epic moments and small emotional ones equally effective. Jason Wordie fleshes the scenes out with a varied color palette that adds the perfect tone to each situation. 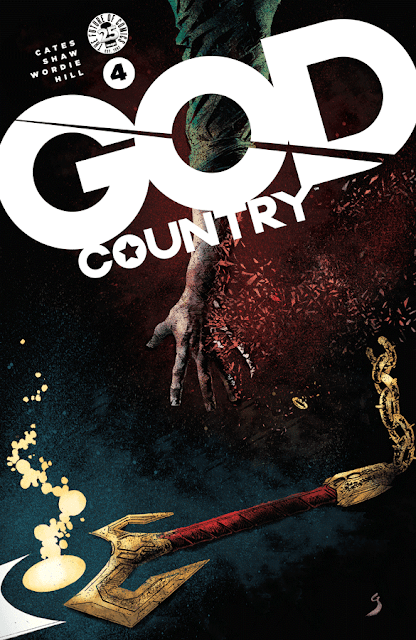 'God Country' is even better than you've heard. That's a credit to this creative team but more importantly to Cates' Emmett Quinlan that drives the narrative with old-man stubbornness, strength, and renewed courage. When everything you hold dear relies on keeping that sword you'd defy gods and monsters to keep it too.